Imagine my excitement in discovering that there was a world wide Qipao day held so close to my birthday....and a non-profit Chinese Qipao Society with branches across the world! As you darlings know, my fascination and collecting passion of the Qipao has been a main focus of Walking in May....bringing me through interesting avenues and meeting lots of lovely new faces. So this new discovery has definitely set some interesting new thoughts in the clockworks, it shall be a new quest for me to hunt down the Chinese Qipao Society's UK branch....or perhaps start one should I be lucky enough! But first let me introduce you to this new little Qipao (Cheongsam) phenomenon sweeping gently across the globe comb by comb. The Global Qipao Day involved Qipao fashion and dance shows across different countries which had a total of over 150,000 Qipao (Cheongsam) wearers participating, mainly organised by the many world wide branches of the Chinese Qipao Society. 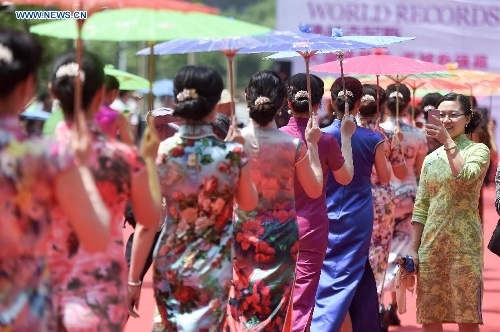 In addition the main 'Chinese Qipao Society' based in China also claimed a Qipao Guinness World Record on the 16th May 2015 for 'the largest gathering for people wearing the Cheongsam in one location'! 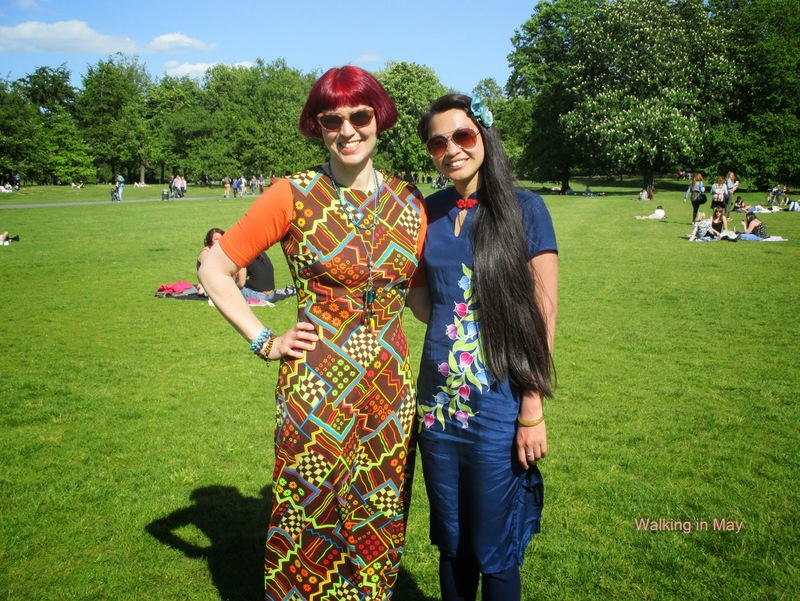 As you darlings might remember....I was actually wearing a Qipao to celebrate my birthday with 'Zen Yoga and Vintage Picnic' fundraiser in Greenwich Park (London) on the very same day without knowing about this event or this international society...how miraculously coincidental. The universe must have aligned what I love to give me a very lovely surprise, though not knowing I was taking part in an international Qipao day, I am glad I did not miss it entirely in this magical way. Wearing a Qipao for my birthday Zen Yoga Vintage Picnic in London on 16th May 2015......on an international Qipao day! The Chinese Qipao Society aims to educate more people about the Chinese culture and celebrate the beauty of the Qipao (Cheongsam). Membership is free and they can be reached on their website; www.zgqp.org or Facebook Page Qipao International, but the language used is mainly Chinese (so those with English only might not be able to fully understand it). The main organisation is based in China and are believed to have many branches or chapters across the globe....hence my new mission to locate the current branch or set up one in the UK, and have started contacting them so fingers crossed! For those who are in Singapore, you might be just in time to enter the Singapore Qi Pao Association (a branch of the Chinese Qipao Society) new 'Qipao Beauty Pageant', as the winner gets to represent Singapore in competing at the 'Global Qipao Pageant' in China this October....what's even more brilliant is that it has a category open to ladies above the age of 50 years old too, celebrating the grace of the Qipao no matter what your age! [Those interested can register with this Google Form link; Qipao Beauty Queen but need to be able to attend the competition in Singapore on 21st - 22nd August 2015, 4th & 19th September 2015 and finally 8th October 2015 in China for the global competition. Good Luck to all ladies entering!] If there happens to be one local to me I would probably join in just for the fun of it, though pageants can be controversial I do feel it can play an important role in attracting our younger generation to try the Qipao...and who knows where it could lead. Anyhow I'm off berry picking in Kent tomorrow as my sister is back in town, so feeling quite inspired to don a Qipao to flounder away under the sun....have an absolutely fabulous weekend darlings and go forth bravely with your Qipao! How lovely that the competition has a category for older ladies! I hope you had fun picking berries.